Daniel Rybakken’s idea for creating a window that produces “daylight” quality light was geared towards the Scandinavian population, where large parts of the year are subject to limited daylight. As anyone who suffers from Seasonal Affective Disorder will tell you, not having daylight makes a room smaller, makes you feel depressed, and generally takes the wind out of your sails, so to speak. The window of daylight is interfaced with a computer, so the device could act as an alarm clock as well as giving an idea of some depth beyond the four walls of the room you’re in. Do you suffer from Seasonal Affective Disorder? Does daylight and light therapy help you? I would like to know how it affects you – please post in the comments, and you’re more than welcome to post anonymously if you need. Previous articleWho Knew Mountain Dew Would Glow?! Problem with creating daylight, well, is that you can’t. There are many lamps on the market they say they do, but all they create is the ‘colour’ not the colour rendering of near 100 which is require to simulate daylight. 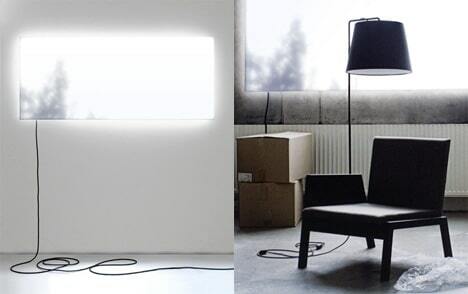 Daniel Rybakken’s idea in creating a false window relies on LED’s which currently are no where near daylight. He also has tried to create the ‘patchy’ effect on indirect/direct daylight which might be sucessful to a certain extent. The depth of a window would be vary hard to achieve due to the volumetric nature of the sky i.e. near infinte depth. So in summary, current technology will never allow you to create a ‘false’ window, but I am sure real daylight does help with SAD. Maybe one day an LED or OLED source consisting of hundreds of different colour sources could create a flat spectral lamp. The nearesr you can get atm is if you over drive an incandescent but it will only last a fews seconds! Sorry to sound like a know it all but I have been designing luminaires for over 20 years and love it!